I’ve come to paradise to stay a few weeks, and it is beauty beyond measure. But, it’s cold. Now, I don’t want to hear it from you guys shoveling snow just to be able to take your dog for a walk (like my DM friend Douglas who lives in Ossining, NY); when you’re at the beach, it’s not supposed to be this cold. This morning brought my last long run before the Seaside Half Marathon, a 14 miler. I wasn’t dreading it, but I wasn’t really looking as forward to it as I usually am, either. Like I said, it’s cold. My eyes opened as God painted the sky at sunrise, then closed again as I snuggled down into my nice, warm bed beside my nice, warm man. My eyes opened again at about 6:30 and I didn’t see the beautiful scene from yesterday that I’ve pictured above outside my window, I saw scores of runners heading east along the beach. We groggily wandered into the living room and while Gary tried to figure out what was going on outside, I made coffee. 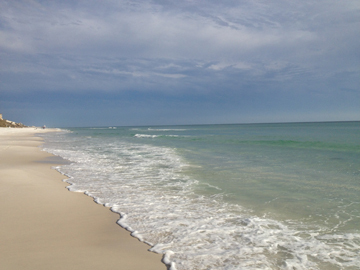 We finally determined that it was the Destin 50 Beach Ultra. Now, for those of you unfamiliar with this type race, an ultra marathon is any distance over 26.2 miles, this one was 50. On the beach. In the cold. Really put my pitiful 14 miler on the bicycle path later that day (when it had warmed up) into perspective. So, I got myself in gear, made breakfast, and began making preparations to start my run. I fooled around with gear and clothes, and whined about the cold until Gary finally said Just. Go. Run. So, I did. Other than some issues with my blue tooth headphones which would make you realize just how dumb I can be sometimes, it was an awesome run. I warmed up after the first few miles (although my nose ran faster than I did), and found my rhythm fairly quickly. 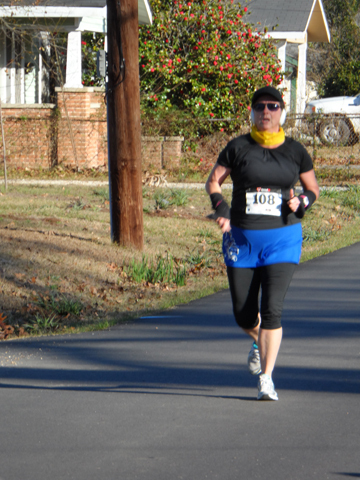 I ran east along the bike path, following part of the half marathon course. I ran through the picturesque towns of Watercolor and Seaside, around the little “square” at Seaside, then continued east out of town. I ran past million dollar homes and homes that needed a million dollars spent on them to make them habitable. Mile 7 arrived before I knew it, and I turned around to head west, back toward our home away from home. Traffic picked up on the return; foot, cycle, and auto, so it was much more crowded as I made my way back through town. The diner/cafes that line the highway in Seaside had opened and were putting off mouth watering aromas that made my tummy growl. When I reached the outskirts of town, I got to the part of the course I like best – the woodsy, beachy paths that line the highway and are part of Grayton Beach State Park, an area I can’t wait to explore in the upcoming weeks. Traffic died down, and only the occasional cyclist whizzed past me, usually announcing with a tinkly, little bell, rather than the usual “on your left”. Got to love that. My legs got achy and crampy at mile 10, and I’ll admit that the last 4 miles were tough. For runs longer than six miles, I do a run/walk interval of 6:00/1:00 (this changes when I have a different pace goal). I have a timer that I wear, and the chime it sounds creates a Pavlovian response in me for which I’m grateful when I come to the end of a run. Ding – I run for 6 minutes, ding – I walk for a minute. I don’t have to think about it, my body just knows. When the walk chimer dinged about 2 1/2 miles from the finish, I looked to the left, and there was Starbucks. It took all the discipline I could call up not to end my run there. I ran on, finished 13.1 at a pretty decent pace, then finished the last mile much more slowly, cooling my body down and stretching my hamstrings. I’m as ready as I’m going to be for the race in 2 weeks. I’ve already started obsessively checking the weather reports multiple times daily. Last year, it rained really hard on Saturday as we came in for packet pick-up, then the sun came out and it was beautiful for race day. I’m hoping for sunny and warmer this year. As I watched those ultra runners this morning, I was reminded of one of my favorite verses. I couldn’t put that better myself. Happy running, my friends. Running provides so much solace to my soul. I read a quote this week, someone had tagged it to Facebook from Pinterest, I think. It said, “On good days, I run. On bad days, I run longer.” I’m so thankful for the ability to “run away.” To lace up my shoes and head out the door with no plan other than healing. Yesterday’s run was that for me. I’ve come to the beach, my place of comfort, on a planned month long getaway with my man. We’ll have to leave on a few work excursions, but for the most part, we intend to play. Run and cycle and explore. I came alone on Wednesday, as Gary had a few days of work at home. It’s been a while since I was completely on my own and the beach has a way of drawing me in, pulling me toward peace and calm. The last few months have been different. I won’t say they’ve been difficult, because I’ve seen people who have difficult circumstances and don’t think I’ve faced anything extraordinary. But, Gary’s accident, my Dad’s decline and death, my decision to work part-time in my profession, all happening during or around the holidays (already a stressful time for everyone) piled more on me than I realized. I’m a “get it done” kind of gal. I don’t really think about the situation while it’s happening, but afterward, when the dust settles, it hits me. 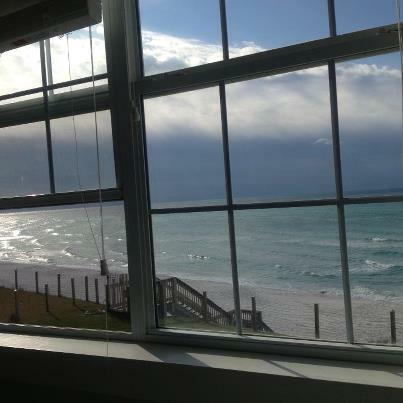 I awoke to the sound of the surf outside my window, and I opened my eyes to the beauty that is God’s world. A smile curved my lips, and I knew it was time to run. I got up, gulped coffee, got dressed and headed out. We’re staying in beautiful Blue Mountain Beach, Florida, with its meandering bicycle/running path that parallels Highway 30A. There are tons of trails in the area that I can’t wait to explore and get lost on, but this morning was just about healing. Running as long as it felt good. On mile two, a man trotted up beside me and we visited as runners do. How long are you running today, what races do you have coming up, that sort of thing. Turns out he’s training for Boston in April and was running 14 yesterday. His pace felt good for a few minutes as we chatted, then I dropped back and told him to enjoy his run and wished him good luck in Boston. In the way of runners, he knew that meant I wanted solitude, so he headed on his way. I ran for another mile or so, then turned back to head home. The sky was overcast, the weather was cool, but it was a healing run. One that soothed a soul that I was unaware was burdened. As I ran, I shed the worries that plagued me for so very long about my dad, I don’t have to worry about him any longer. I shed the need to over “mother” my man as he heals. He can get along very well without my interference, and much prefers it that way, I’m sure. Each mile my worries over family situations and work problems dropped farther and farther behind. With every step, I felt renewed and strengthened. I picked up a few things along the way, as well. Creativity bloomed, ideas emerged, hope blossomed and swelled. This run, this short time of running away to the beach, is more about running toward something than running away. I’m not sure what it is yet, but it’s right there, just over the horizon. I can’t wait to figure out what it is. I’ll stop writing here. 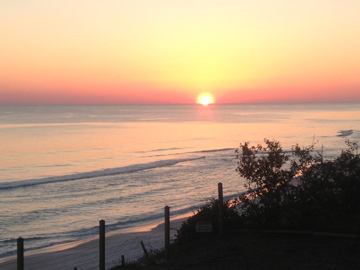 It’s time to head down to the beach to watch the sunset. Happy running away, my friends. May all your running away lead you back home where you belong. I love my legs. Not in a prideful way, though. I am, after all, very aware of their limitations. They’re several inches shorter than they should be and chalky white. My right IT band pings with pain when I even think the word “it” and my left hip flexor reminds me constantly that it is 51 years old and not getting any younger. So, why do I love them? They’re strong and solid. They can hurt and complain, but they get me where I’m going. They provide a solid base for my building blocks of running, always willing to move me forward, and often willing to do it with flair. The rest of me may not cooperate, but my legs are always on board for a run, they’re just waiting for the word. A strong foundation on which to build a running plan for life. My childhood was like that. I’m sure it wasn’t the storybook youth that I remember, it had its times of trouble, pain, and sorrow, but it was a strong, solid foundation on which to build a life. At the head of that foundation was my Daddy. He was a well of strength that we drew from to grow. He taught us so many things, loved us well, provided for us the best he could, and most of all, laid the foundation for the faith that was to become the center point of my life. We laid him to rest this week, but it wasn’t a week filled with sorrow, it was one of celebration. It was physically, emotionally, and spiritually draining, but I wouldn’t change a single moment of it. Some of the week’s highlights for me included: being able to be with my dad in the last moments of his life; watching my daughter and nieces say good-bye to their much loved grandfather; having my entire family on this hill at the same time; visiting with family and friends not seen in far too long; comfort food provided by the loving hands of precious friends; my brother-in-law and nephew’s rendition of “How Great Thou Art” at the funeral; my brother-in-law’s perfect eulogy; the bagpipes played at graveside thanks to my sister Mel’s memory that Dad wanted those; seeing all my sister’s grandchildren together for the first time in their young lives & the photo session that necessitated; the long, easy bike ride my man and I took with our girls on Wednesday; meals shared with family all under the same roof at once; laughing over memories with family and friends; and seeing my man in a suit. My Dad was a powerhouse of strength for all the years he needed to be. I put together this slideshow for the funeral celebration, and some of our family and friends were unable to make the trip, so I thought I would share it here, as well. The music was an odd selection for me, but my dad sang “The Old Rugged Cross” and “Swing Low, Sweet Chariot” to me as lullabies when I was little, then to his beloved grandchildren when they were, so the choice was made for me. If your parents are still with you, love them, reach out to them, draw strength from them. Life is short on this side of heaven, don’t waste a single moment. Runners are obsessive creatures. We painstakingly research and critique equipment, looking for the perfect shoe, the right clothes, the best new toys that will give us that slight edge in our training. Once we find what works, we’re loyal to our brands, always purchasing the same models in the hope that “if it ain’t broke, don’t fix it.” We often resemble ball players who wear the same sock or glove for every game after one has proven its worth in winning, and have been known to fall into an hysterical frenzy on race morning if we can’t lay our hands on that lucky piece of equipment. Or, maybe that’s just me. 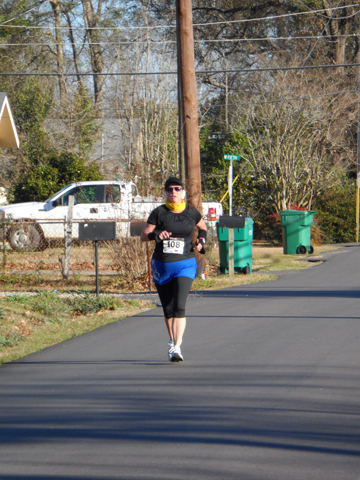 If you look at any of my race photos, you will see me in a white hat with pink writing. I got this hat a few years ago at the Princess half marathon in Disney World. It’s been the perfect hat, made of techie fabrics that keep the sun off my face, while allowing the heat to vent out and help keep me cool. It even has a crown on it, and all you gals know how important it is to run in a crown. I’ve worn it for every race and most training runs since its purchase, and its frequent washings have left it soft and pliable, but still able to work its magic. My dad was always proud of my running. He told anyone willing to listen about my races. Everytime I went see him, he wanted to know how far I ran that day, how fast it was, and how I felt. I frequently took my iPad when I went to see him, to show him pictures of races, and read my blog posts aloud to him. After my half marathon in November, I was showing him the race photos, and he wanted to know why I didn’t wear my black hat. I looked at him in confusion and told him I didn’t have a black hat. He reminded me that, indeed I did have a black hat, he had given it to me a few weeks before after a visitor had left it for him. I finally remembered it, one of those old, boxy style hats, made of cheap cotton with a cardboard brim. Nothing high tech about it. I didn’t have the heart to tell him that I had no idea where it was, and that it certainly wasn’t made for running in the Mississippi heat. A few weeks ago, though, I was rummaging around in my trunk and found it, buried under some towels and reusable grocery bags. I got it out and put it with my other gear, determined to wear it at my next race for dad. Many of you know that my sweet daddy was called home on Thursday of this week. Those of us who live close by spent the day with him, gathered around his bedside, whispering into his ear, loving on him. It was a bittersweet send off; he’s reunited with my mom now, released from a body and mind that had become a prison, but we’ll miss him. It was a long, emotional day, and I allowed myself to become dehydrated and spent the evening being sick. I felt better on Friday as we raced around making final preparations, but nowhere near 100%. Kaitlyn and I had planned on running in a local 5k on Saturday, but I wasn’t sure I was up to it. Even so, I decided that if she still wanted to, we would run it for dad. 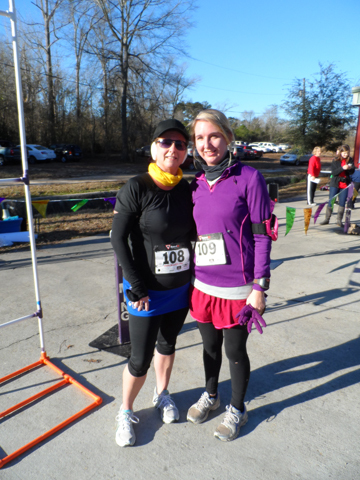 She wanted to, so we got up yesterday, bundled up in our warmest running clothes and headed out. Of course, I wore the black hat. Kaitlyn had an excellent race, taking two minutes off her best time! I ended up with a PR, as well, but I have to say that it hurt more than usual. Still, I’m glad we ran it, and I know Dad would have approved. I’m sure he and Mom were applauding from heaven as we pounded across the finish line. I hope he noticed the hat.